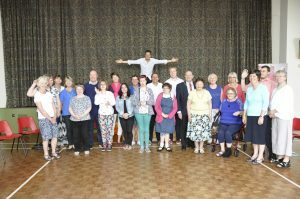 On 12th June the Mayor and Mayoress visited our church to attend a special workshop run by the Whole Notes – a community choir for adults with autism, social anxiety or a learning disability. 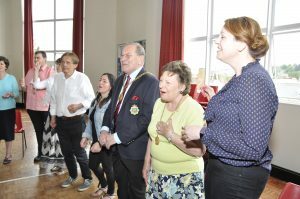 It was great fun and the Mayor and Mayoress joined in with great gusto. 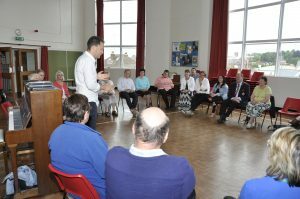 The Choir meets every Tuesday lunchtime in the Hall. It’s run by professional musician Alison Wrigley, a specialist special needs teacher for Surrey County Council. Alison’s enthusiasm and commitment are very infectious and she makes everyone feel very welcome.